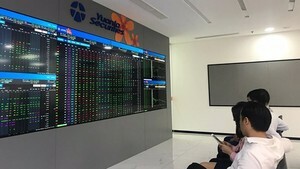 Stocks on the Ho Chi Minh Stock Exchange failed to sustain the morning's gain as investors increased selling when the index moved towards a high of 610 points. The benchmark VN-Index inched down 0.07 percent to close at 604.64 points on August 19 while the VN30, which tracks the top 30 shares by market value and liquidity, was down 0.24 percent to end at 645.46 points. Excluding shares of PV Gas (GAS), the biggest stock in term of market value, which gained 0.9 percent in value, many large-cap stocks lost value including Masan Group (MSN), Vinamilk (VNM), Kinh Do Corporation (KDC), Hoang Anh Gia Lai Company (HAG) and Saigon Securities Inc (SSI). FLC Group (FLC), the most active stock with 15.8 million shares, also went down 0.75 percent to finish at 13,200 VND per share. Liquidity decrease compared with the previous session with the market value falling about 30 percent to over 2.794 trillion VND (132.4 million USD) while the volume of trades totaled more than 134 million shares and fund certificates. On the Hanoi Stock Exchange, profit-taking activity also pushed the HNX-Index down 0.57 percent to finish the session at 82.66 points. According to analysts at FPT Securities Company, many investors took advantage of growing market optimism to earn profits amid fears of technical corrections. Oil and gas companies like PetroVietnam Technical Services (PVS), PetroVietnam Drilling Mud (PVC) and PetroVietnam Northern Gas (PVG) led the downturn after they made impressive gains in the previous days. The market condition was negative with 144 codes declining, 90 rising and 152 closing unchanged. Trading also waned with market volume down 25 percent from August 18 to just 58.3 million shares while value of trades fell 15 percent, totaling over 783 billion VND (37.1 million USD). PetroVietnam Construction Corporation (PVX) led the northern market in term of volume with seven million shares traded. PVX's prices climbed 2.13 percent to settle at 4,800 VND per share.